And More . . .
Do thinkers have more job satisfaction, job retention, and potential for promotion? Exemplary workers know what is important to their jobs and organizations—they put their efforts in the right places. Two people with similar experiences and education may perform quite differently when starting a new job. Within weeks, one person starts to take the initiative to carry out tasks and make decisions; the other person remains hesitant and uncertain. When the work conditions change, the first person adapts quickly but the other becomes upset and uncertain. I contest that one of the factors that makes the first person effective is that he or she has figured out what is important to the job and the organization and uses specific thinking strategies to work effectively, efficiently, and safely. In addition to being skilled, exemplary workers use a broad range of critical thinking strategies to maintain outstanding performance. They do the most important things, do them effectively, and do them efficiently. Because they know what is important to the job and the organization, they effectively coordinate their actions with others and make decisions in the best interest of their organizations. Knowledge and thinking skills empower workers to achieve exemplary performance, be flexible as workplaces continue to evolve, and provide leadership. All organizations want to get the most out of their assets, including their people. Organizations prefer to have exemplary workers that contribute to business success. One way for workers to focus on issues important to an organization is to use the LO-PEMEO model as shown in the following illustration. LO-PEMEO stands for Loss and Optimization of People, Equipment, Materials, Environment, and Organization. As an example: Loss to People is illness and injury; Optimizing Peoples’ performance is working effectively and efficiently; Loss to Equipment is damage and shortened operating life; and Optimizing Equipment is using equipment effectively and efficiently. Each domain can affect the other domains. For example, if there is a large acid spill, both worker and public safety could be affected. 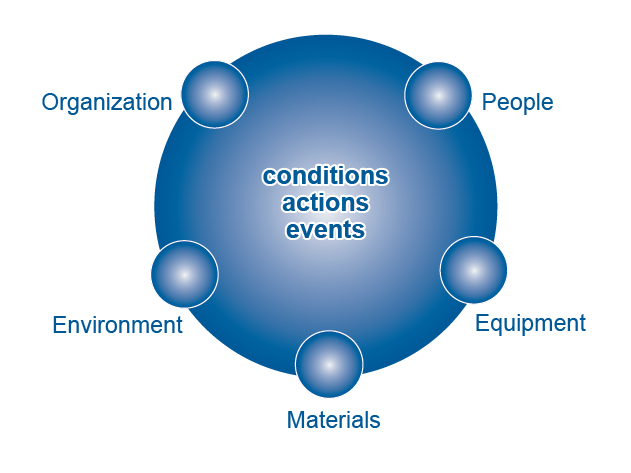 Materials, equipment, and the environment could be damaged, and the organization could experience losses. Optimizing the use of tools and equipment that are designed for the application improves safety, reliability, and product quality, reduce waste, and increase production. Furthermore, workers can assess the work environment by considering the conditions, actions, and events within the workplace that affect PEMEO. Workers can ask themselves specific questions about minimizing losses and optimizing performance of PEMEO. Specific thinking strategies and questions for each PEMEO domain apply to most tasks and work environments. Being aware of one’s own thinking strategies contributes to planning and working effectively and helps to communicate effectively when collaborating with others and mentoring apprentices. To learn more about the LO-PEMEO model, refer to The Exemplary Worker books series. These books place a strong emphasis on using thinking strategies and asking the right questions—the goal is for workers to contribute to improved worker, job, and business performance. Does this model cover the major areas of concern for you in your job?